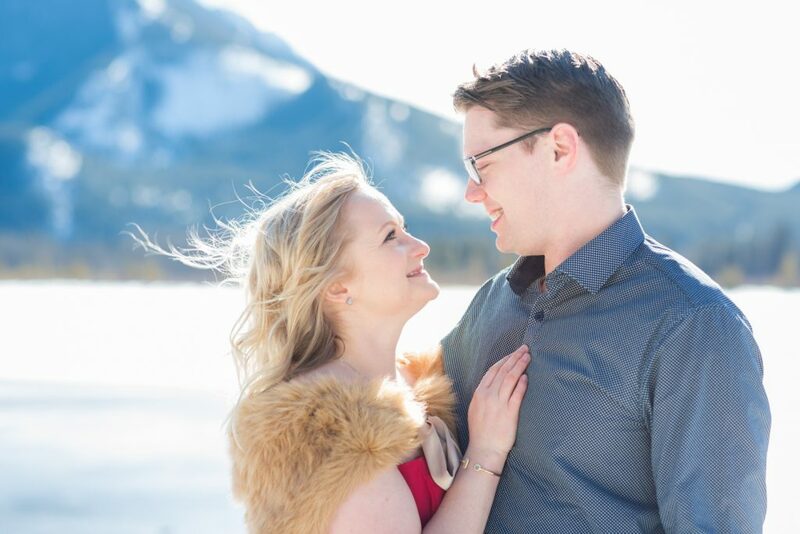 It was a gorgeous winter day when we met this crazy cute couple for their mountain session. 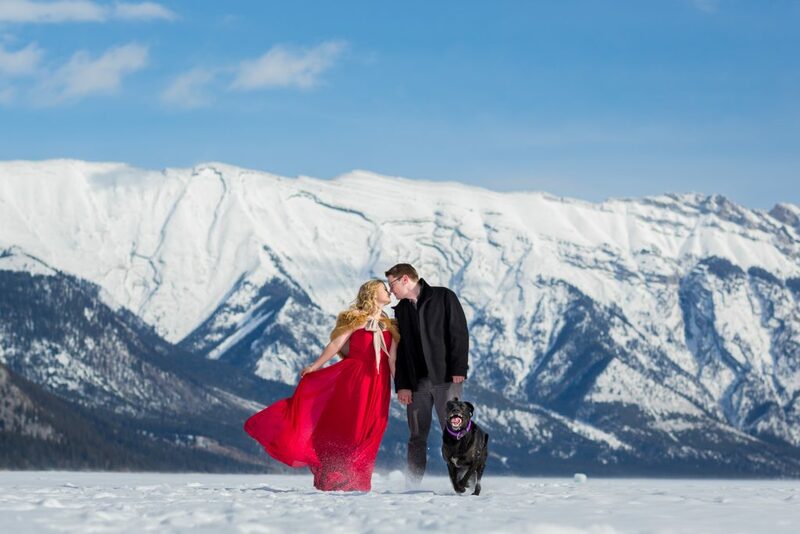 Jessica and Yannick brought their spunky black lab Bella along for their winter engagement photos in Banff. Most people know Banff National Park for its stunning mountains, breath taking scenery, for hiking in the summer and skiing in the winter. 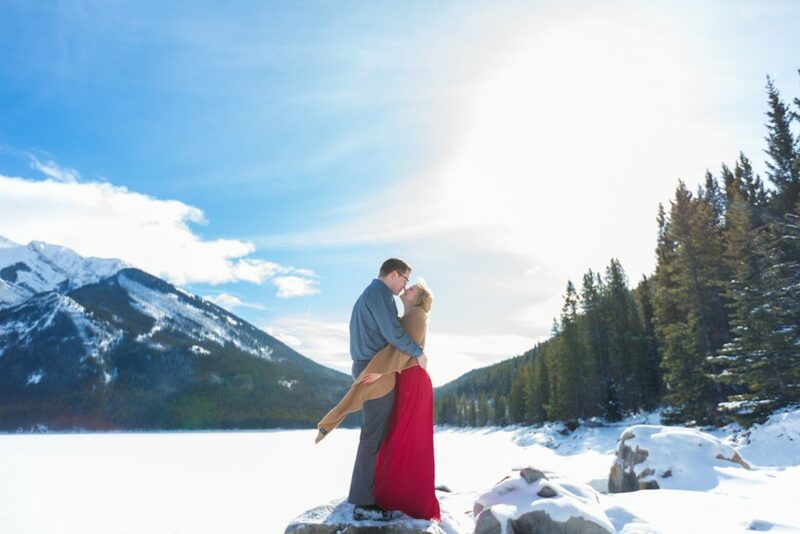 We love Banff for its epic winter landscape, when the bright blue sky meets the snow covered peaks and love is in the air. 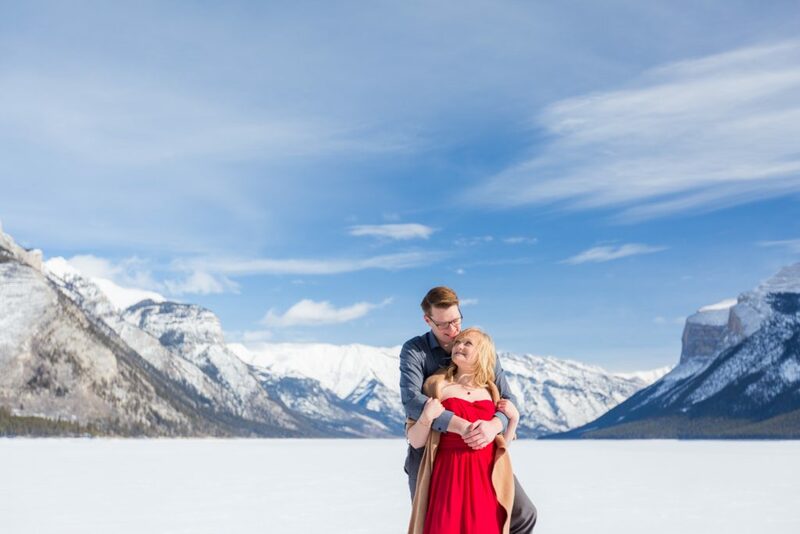 This dramatic backdrop was perfect for Jessica and Yannick’s sweet and romantic photos. 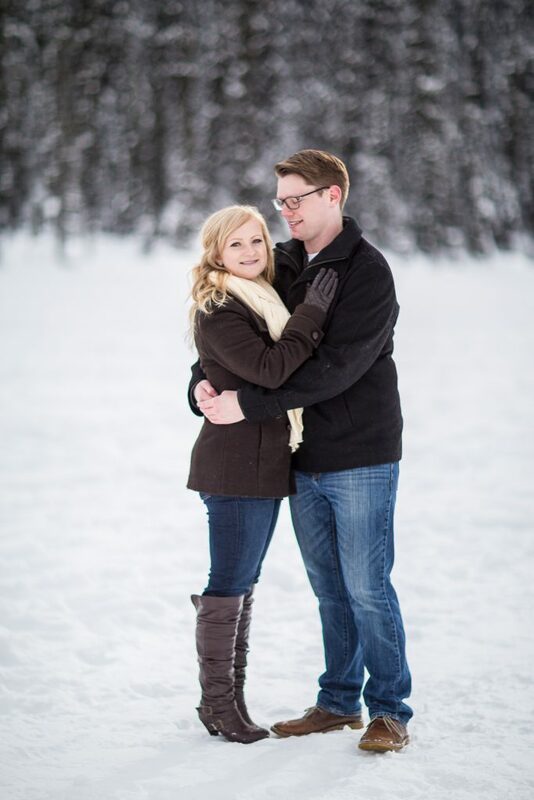 These two knew exactly what to wear to rock their winter engagement session. Jessica wore an elegant full length red dress which paired perfectly with Yannick’s semi formal suit. The formal look was topped off by a fur wrap which helped to keep Jessica cozy warm. 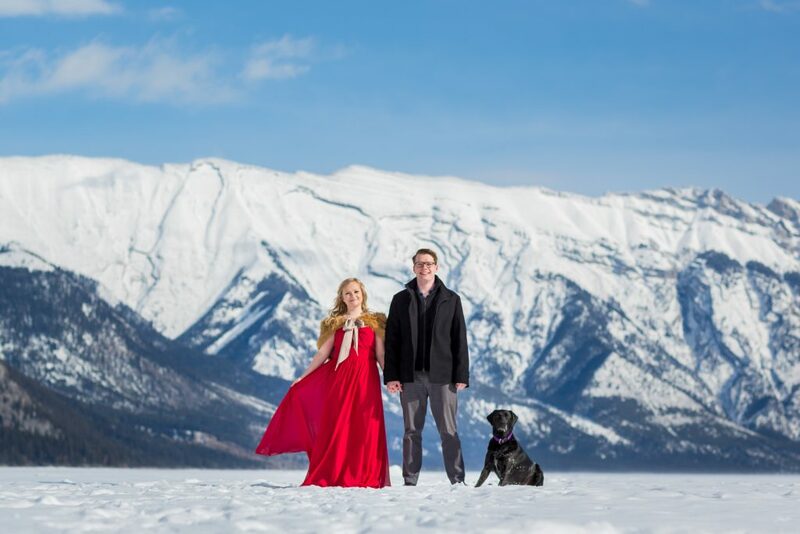 The vibrant gown gave a jewel like pop of colour against the blue sky and mountains. 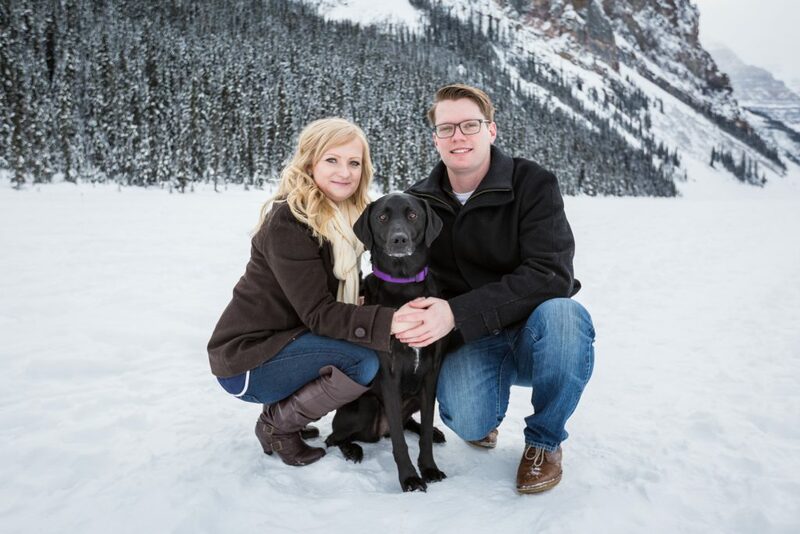 A big part of Jessica and Yannick’s life is their sweet black lab, Bella. This perfectly polite pooch stole the show. 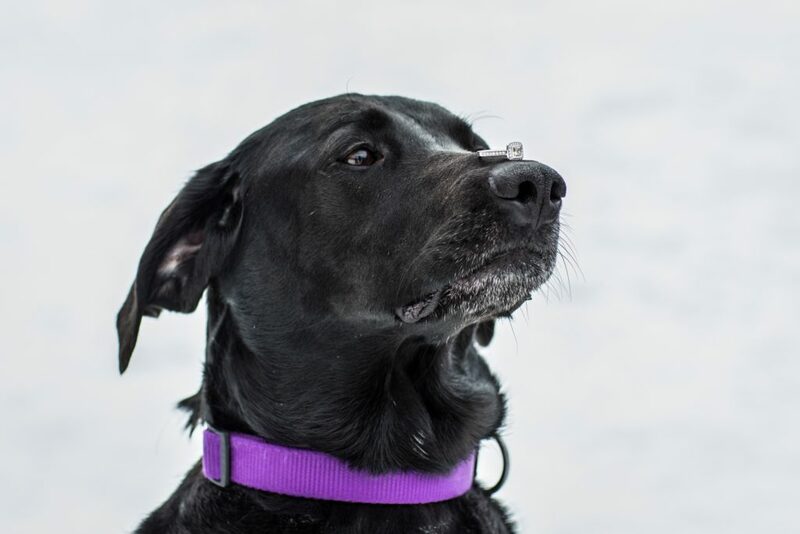 Bella even showed off her poise with a perfect ring-on-nose balance. 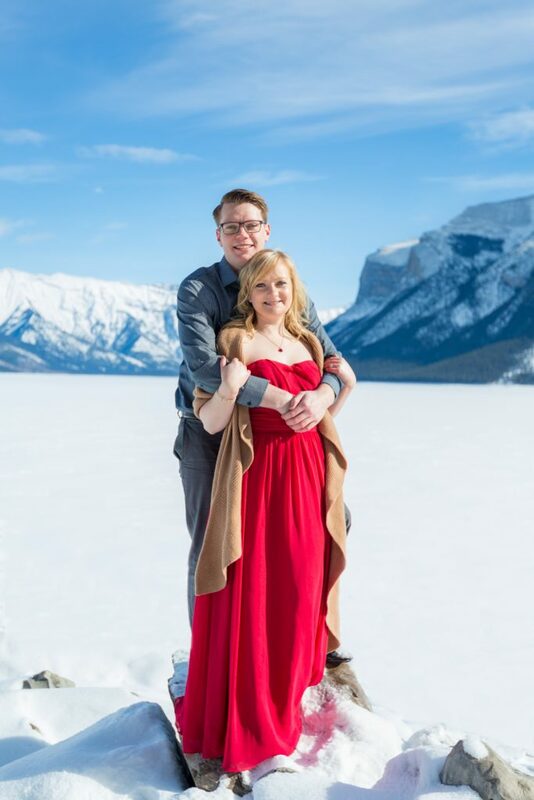 As the sun began to set over the snowy mountains, Jessica and Yannick changed into more casual clothes. 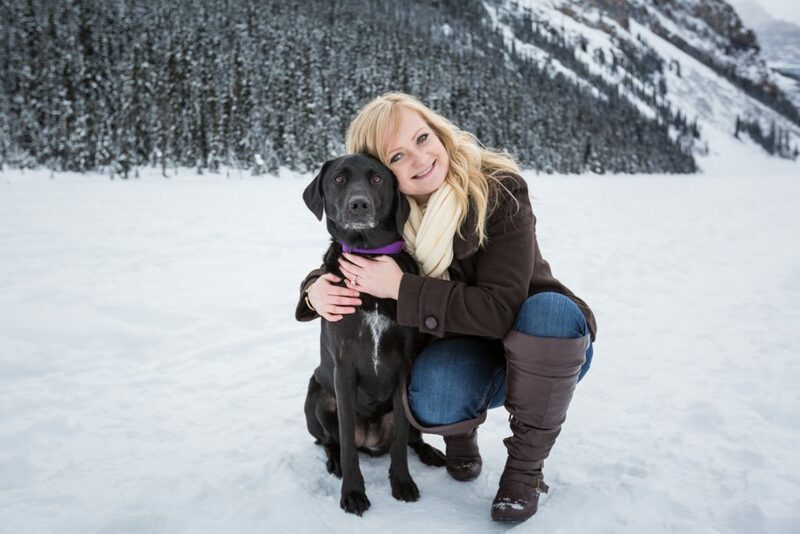 Jeans, sweaters and cozy knitted mittens were perfect for a walk around Lake Louise and some snuggles with Bella. 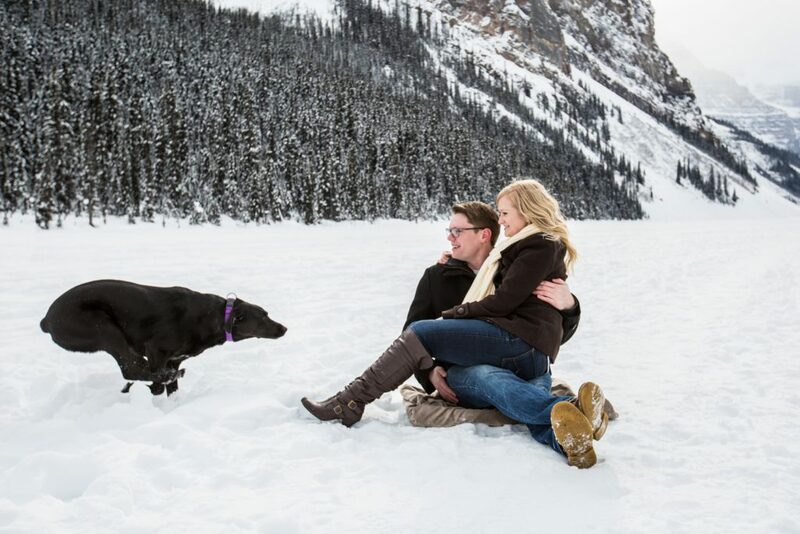 We love it when couples bring their dog along for their engagement photos. 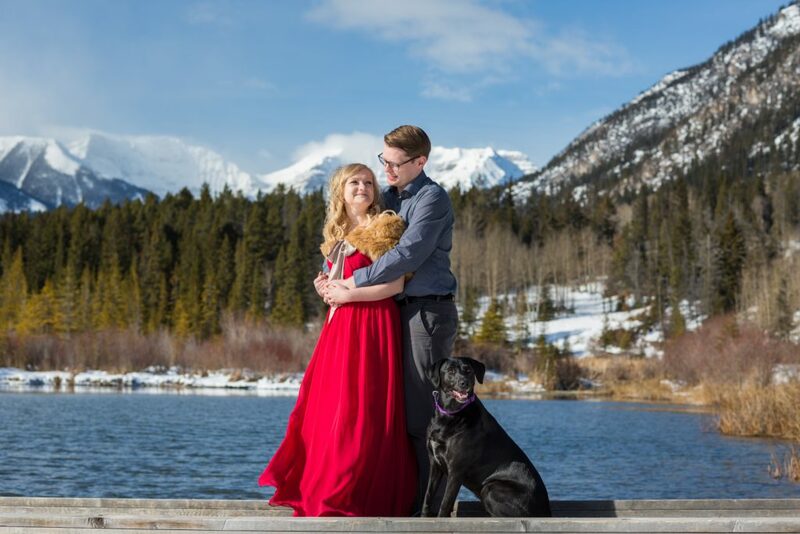 They tend to relax the couple and take a lot of the pressure off of having professional photos done. 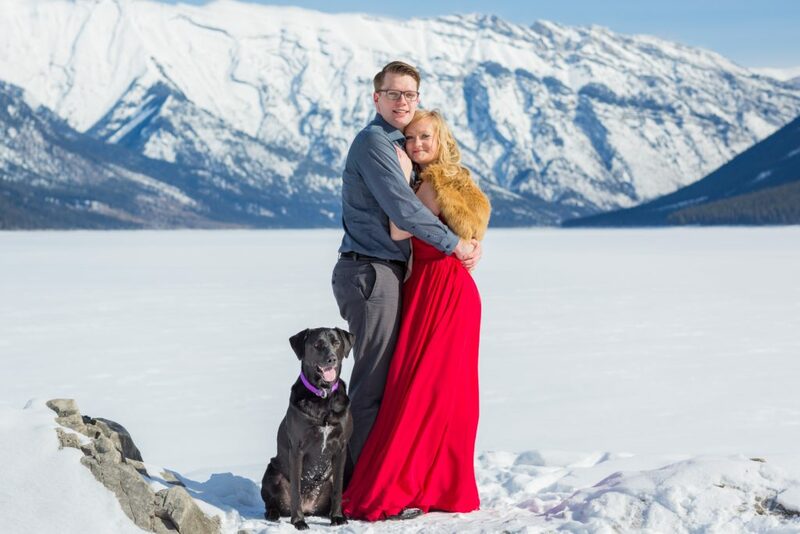 The couple is able to focus their attention on their pet, relax and enjoy the experience. 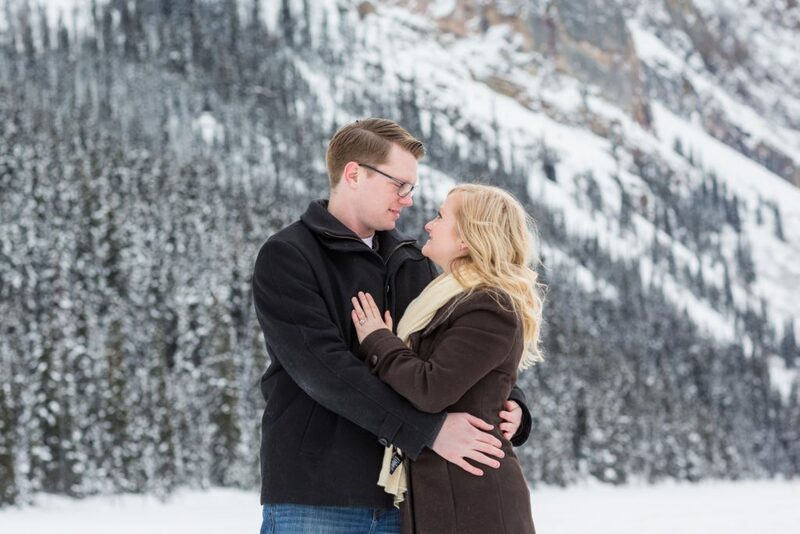 Banff is a gorgeous place to visit any time of year, but we are especially fond of the winter. 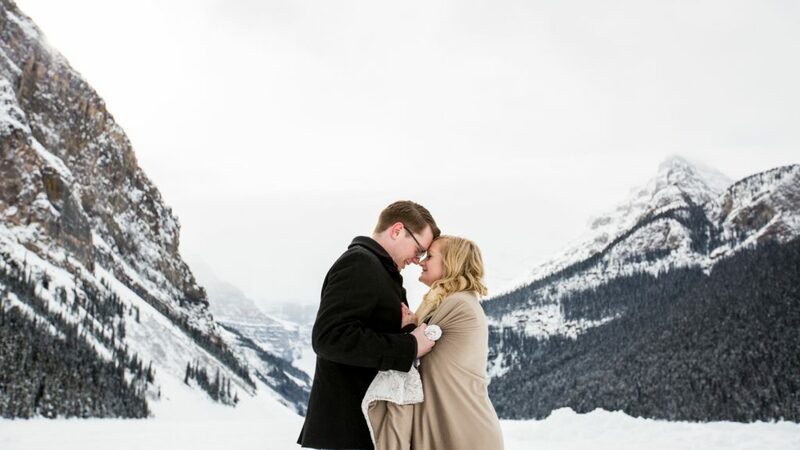 Check out this page for our favourite winter locations in Banff!